ELIGIBILITY. The Camp Sweepstake (“Sweepstake”) is open to legal residents of the contiguous forty-eight (48) states of the United States, and the District of Columbia who are 21 years of age or older at the time of entry, and a registered account holder with Coffee Meets Bagel (“Entrants”). Void in Rhode Island, Alaska, Hawaii, Puerto Rico. 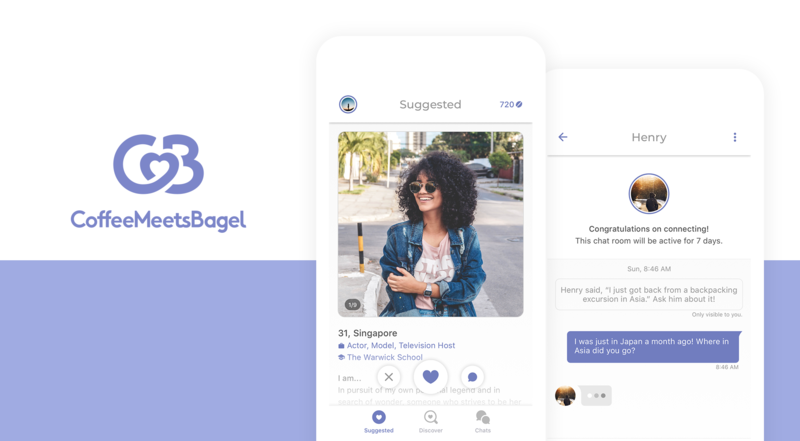 Sweepstakes is sponsored by Coffee Meets Bagel, Inc., 111 Ellis Street, San Francisco, California, United States of America, 94107 (“Sponsor”). Employees of Sponsor, advertising and promotion agencies and all other entities participating in the design, promotion, marketing, advertising, administration or fulfillment of this Sweepstakes and their immediate families are ineligible to participate in this Sweepstakes. Void in countries restricted or prohibited by law. Entrants’ rights and responsibilities may vary by jurisdiction. SWEEPSTAKES PERIOD. The Sweepstakes begins at 12:01 a.m EST on April 4, 2018 and ends at 11:59 p.m. EST on April 6, 2018 (the “Sweepstakes Period”). SELECTION AND NOTIFICATION OF SELECTED ENTRANTS. On or about April 9, 2018, Sponsor will randomly draw one Entrant from among all eligible entries received. The winner (“Selected Entrant”) will be notified via an Instagram Story posted on Sponsor’s Instagram handle (“Notification”) and Instagram Direct Message. The Selected Entrant will be required to respond (as directed) within seventy two (72) hours of attempted Notification. Selected Entrant’s failure to respond timely to the Notification may result in forfeiture of the Prize, and in such case, Sponsor may randomly select an alternate Selected Entrant from among the remaining eligible entries, up to three (3) times. The Selected Entrant may be sent a consent to background check and declaration of eligibility / liability / publicity release (“Release”). Except where prohibited by law, the Release will state that Selected Entrant agrees to allow Sponsor to use (without additional compensation) Selected Entrant’s name, address, photograph, testimonial, likeness and/or biographical information for purposes of advertising and promotion (including, without limitation, posting on Sponsor’s website(s) and affiliated website(s)). Selected Entrant may also be required to provide name, ID card (for tax purpose), birth date, current address, and phone number. Unless restricted by law, the Selected Entrant will be required to complete and return the Release within the time period specified therein. The Prize may be forfeited, and in such case, an alternate Selected Entrant may be randomly selected from among the remaining eligible entries if the Selected Entrant (up to three (3) times): (i) cannot be reached; (ii) does not respond to the Notification in a timely manner as required pursuant to these Official Rules; (iii) fails to obtain all signatures on the Release and to return the documents in a timely manner as required pursuant to these Official Rules; or (iv) cannot accept or receive the Prize for any reason. Non-compliance with these Official Rules may result in disqualification and selection of an alternate Selected Entrant. Sponsor may not make multiple attempts to contact Selected Entrants. PRIZE. One (1) prize winner. The Selected Entrant will receive two entry tickets to Camp Meets Bagel event located in Paradox, NYC, from May 10th to May 13th. Approximate retail value (“ARV”) of the prizes: US$1,500. PRIZE CONSIDERATIONS. The specifics of all aforementioned elements of the prize in the Sweepstake shall be solely determined by Sponsor. All costs, taxes, fees, and expenses associated with any element of the prizes not specifically addressed above are the sole responsibility of the Selected Entrant. All federal, state and local taxes on the prize are the Selected Entrant’s responsibility. Selected Entrant and the travel companion must provide their own transportation to NYC or the camp site. No refund or compensation will be made in the event of the cancellation or delay of any flight. Prize is non-transferable and no substitution will be made except as provided herein at the Sponsor’s sole discretion. Sponsor reserves the right to substitute the Prize (or a component thereof) for one of equal or greater value if the designated prize should become unavailable for any reason. If Selected Entrant and the travel companion are unable to fulfill Prize during time period, Selected Entrant forfeits the Prize in its entirety and an alternate winner may be selected. Any incidentals, tips, telephone calls, or any other personal expenses incurred during the trip are the responsibility of the Selected Entrant. All other expenses not specifically identified as included in the Prize are the sole responsibility of the Selected Entrant. Selected Entrant and travel companion are responsible for obtaining travel insurance (and all other forms of insurance) at their option and hereby acknowledge that the Sponsor has not and will not obtain or provide travel insurance or any other form of insurance. Once the travel companion is selected, he/she may not be substituted, except at the Sponsor’s sole discretion. If Selected Entrant is not able to travel to the camp site, the Prize will be forfeited in its entirety and an alternate winner may be selected. Travel companion of Selected Entrant must be at least twenty one (21) years of age or older, and must sign a Liability and Publicity Release. If Winner’s travel companion fails to return such documents within date and/or time indicated within such documents, then the Selected Entrant may forfeit the right to the travel companion. Prize cannot be transferred, substituted, or redeemed for cash except at Sponsor’s sole discretion. Sponsor reserves the right to substitute the prize, or portions thereof, with a prize of equal or greater value. CONDITIONS. All federal, state or other tax liabilities (including income taxes) arising from this Sweepstakes will be the sole responsibility of Selected Entrant. Selected Entrants’ rights and responsibilities may vary by jurisdiction. Except where prohibited by law, the Selected Entrant’s entry and acceptance of the Prize constitutes permission for Sponsor to use said Selected Entrant’s photograph, likeness, statements, biographical information, voice, name and city and state address for promotional or advertising purposes in connection with these Sweepstakes on a worldwide basis, and in all forms of media, now or hereafter known, in perpetuity, without review, permission or further compensation. By participating, Selected Entrants agree to be fully and unconditionally bound by these Official Rules and Sponsor’s decisions and waive any right to claim ambiguity in the Sweepstakes or these Official Rules. Selected Entrants also agree to release, discharge, indemnify and hold harmless Sponsor, and its officers, directors, employees, representatives and agents from and against any claims, damages, disability, attorneys’ fees, and costs of litigation and settlement, as well as any liability due to any injuries, damages or losses to any person (including death) or property of any kind resulting in whole or in part, directly or indirectly, from: (i) use, redemption, acceptance, possession, ownership, or misuse of any prize, (ii) participation in any activity, event, or excursion offered in connection with the prize, (iii) use of any facility, service and/or accommodation related to the prize, or (iv) participation in any Sweepstakes-related activity or participation in this Sweepstakes. Sponsor reserves the right to disqualify any Entrant it finds to be tampering with the entry process or the operation of the Sweepstakes or violating these Official Rules, and reserves the right at its sole discretion to terminate the Sweepstakes and, if terminated, at its discretion, select the potential winner(s) in a random drawing from among all eligible, non-suspect entries received prior to action taken. Sponsor shall not be liable for: (i) late, lost, delayed, void, corrupted, misdirected, incomplete unreadable, inaccurate, garbled or unintelligible entries, communications or declarations, regardless of the method of transmission; (ii) telephone system, telephone or computer hardware, software or other technical malfunctions, bugs, lost connections, disconnections, delays or transmission errors Sweepstakes Entrants may encounter when submitting their entry; (iii) data corruption, theft, destruction, unauthorized access to or alteration of entry or other materials; (iv) any injuries, losses or damages of any kind caused by the prize or resulting from acceptance, possession or use of a prize, or from participation in the Sweepstakes; or (v) any printing, typographical, administrative or technological errors in any materials associated with the Sweepstakes. Caution: any attempt to deliberately damage or undermine the legitimate operation of the sweepstakes may be in violation of criminal and civil laws and will result in disqualification from participation in the Sweepstakes. Should such an attempt be made, Sponsor reserves the right to seek remedies and damages (including attorney fees) to the fullest extent of the law, including criminal prosecution. DISPUTES. Disputes regarding these Official Rules and/or this Sweepstakes will be governed by the internal laws of the State of California, except where prohibited by Canadian law. By entering, you consent to jurisdiction in the federal and state courts of California for the resolution of any and all disputes. GENERAL CONDITIONS. By participating, Entrants agree to be fully and unconditionally bound by these Official Rules and the decisions of Sponsor and waive any right to claim ambiguity in the Sweepstakes or these Official Rules. Any portion of the Sweepstakes may be canceled, suspended and/or modified, in whole or in part, if in Sponsor’s opinion any fraud, technical failure or other factor beyond our control impairs the integrity or proper functioning of the Sweepstakes. Sponsor reserves the right in its sole discretion to disqualify any individual who is found to be tampering with the entry process or the operation of the Sweepstakes or to be acting in violation of these Official Rules, or to be acting in an unsportsman-like or disruptive manner, or with the intent to disrupt or undermine the legitimate operation of the Sweepstakes, or to annoy, abuse, threaten or harass any other person, and Sponsor reserves the right to seek damages and other remedies from any such person to the fullest extent permitted by law. Sponsor reserves the right at its sole discretion to terminate the Sweepstakes and, if terminated, at its discretion, select the potential winner in a random drawing from among all eligible, non-suspect entries received prior to action taken. You may not enter with multiple identities or use any automated system, bot or other device or artifice to enter or obtain more than the maximum number of qualified entries. Unclaimed Prizes will not be awarded. PUBLICITY. Except where prohibited by law, the Selected Entrant’s acceptance of the Prize constitutes permission for Sponsor to use said Selected Entrant’s full name, social media handles, photographs, likeness, statements, biographical information, voice, and city and state address for promotional or advertising purposes in connection with the Sweepstakes on a worldwide basis, and in all forms of media, now or hereafter known, in perpetuity, without review, permission or further compensation, including without limitation on Sponsor and its affiliates’ program(s), website(s) and social media page(s). © 2018 Coffee Meets Bagel, Inc. All rights reserved. Happy International Women’s Day! 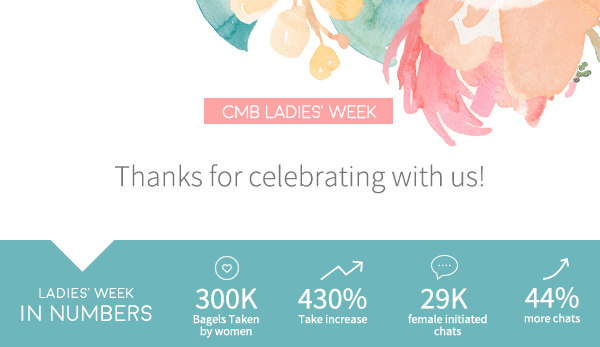 #CMBLadiesWeek How Does Coffee Meets Bagel Work?